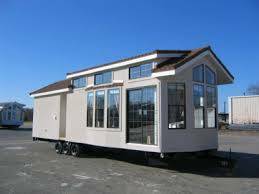 THE PREMIER MANUFACTURED HOME BLOG: A Tiny House Is A Tiny House Is A Tiny House and An ADU Is An ADU. and An ADU Is An ADU! The question here is to discern between a "TINY HOUSE" and an "ACCESSORY DWELLING UNIT" (ADU). 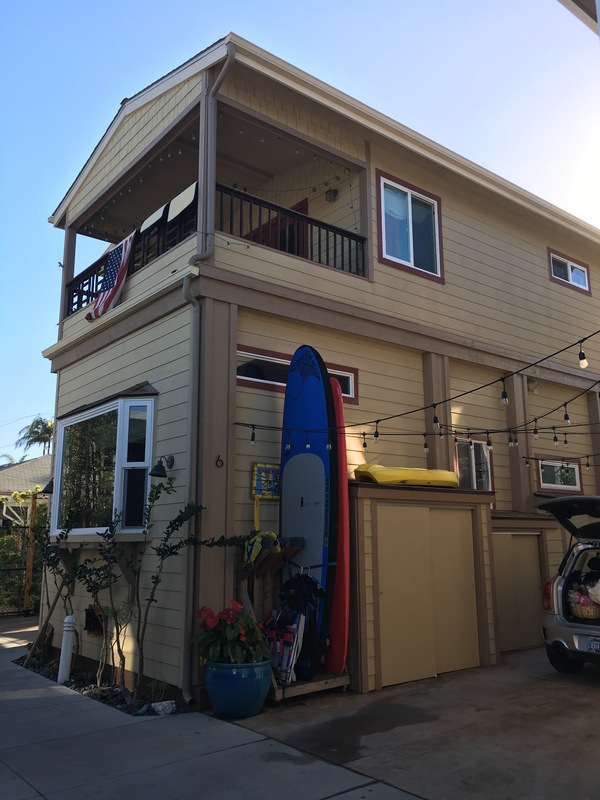 Many folks are of the opinion that a Tiny House is the same as an Accessory Dwelling Unit (ADU). A Tiny House is a small home and/or custom made travel trailer with wheels and axles (top photo) that can be moved from one location to another. However, much like a Park Model (photo below) it is still an RV. Here's how RVIA defines an RV. "The Recreation Vehicle Industry Association (RVIA) is the national trade association representing recreation vehicle (RV) manufacturers and their component parts suppliers who together build more than 98 percent of all RVs produced in the U.S."
"An RV is a vehicle designed as temporary living quarters for recreational, camping, travel or season use. RVs may be motorized (motor homes) or tow-able (travel trailers, folding camping trailers and truck campers). Off-road vehicles are not included in the RV definition." And yes it is true. 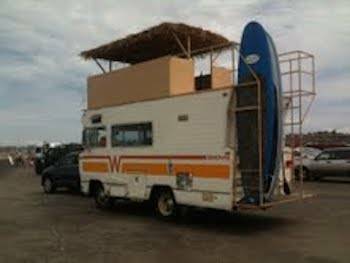 RV's can come in some pretty unusual shapes and sizes. But it doesn't necessarily mean they are allowed to be used as an ADU on a private lot/parcel. Some RVer's can get pretty creative but at the end of the day they still have to be street legal and be able to pass safely under overpasses, trees and electrical lines. Or 2 story (bottom HUD Manufactured 2nd floor site built) "Hybrid"
I question whether or not RVIA has or would ever recognize them unless they were built to RVIA standards. 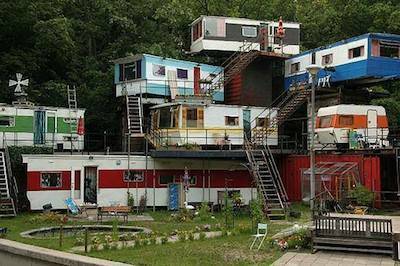 I also wonder if RV & trailer parks would allow them unless they did meet RVIA standards. The question of safety comes to mind first and foremost. Would or could they be a threat to others in an RV or trailer park? It is a fact that Park Models, RV's, Travel Trailers, etc. are not permitted as permanent structures in most Cali building and zoning jurisdictions. In fact a park model cannot be affixed (permanently installed) even in a Manufactured Home Community let alone on a private lot/parcel. So I don't expect to see "Tiny Houses" to be allowed anytime soon albeit they are being looked at very closely. The question really is, is there a place for "Tiny Houses" and if so when, where and how? Hmm I don't think that a tiny house is defined by having wheels. My conceptions of this may be based primarily on the TV show Tiny House, Big Living which showcases a wide array of tiny houses both mobile and not. I believe a tiny house is simply any house that is smaller than say 500 sqft. Tiny houses can be permenant or mobile. I belive the main difference between a tiny home and an ADU is that an ADU is an accessory dwelling unit, impying that there is a primary dwelling unit. If you build a 500 sqft house behind your main house it couldn't it be both an ADU and a tiny home? Naturally any dwelling under 500sf is pretty tiny indeed. However, what I'm gleaning is that if you label your structure a "Tiny House" when you walk into a building departmet to pull a permit all types of red flags go up Erika Albert Building departments are having enough difficulty trying to wrap their arms around the whole concept of ADU's. I know first hand as I have been pulling permits and building/installing factory and site built Housing on small dwellings for 30 years. I've actually seen folks going into a building department with a design for an ADU and make the mistake of calling it a Tiny House. The first thing the counter person says it "Tiny houses" are not permitted on real property in this County. Can't get much clearer than that. It kinda reminds me of the days when "Mobile Homes" were just starting to be built and folks would refer to them as "Trailers" which many if not most were in the early '60's-'70's until they introduced the HUD Manufactured Home in 1976. But the damage was already done. By that time the stigma was already cast in stone and even today folks refer to a HUD manufactured home as a trailer, mobile home and even a coach. My take is call it what it is. Don't let the same thing happen to the ADU industry that happened to the HUD mfg and Modular industry. My 3 cents/sense adjusted for inflation. John, Great information for people. Many areas have a restriction on size so it good to know what you trying to do. John- I'm still taking all of this in, and am amazed at your last photo! Is that for real?? When I first became acquainted with the Tiny House movement, I immediately became enamored with it. I'd love to have one some day! Thank You so much for helping me spread the word Myrl Jeffcoat. I heard it is indeed the real deal Kathy Streib, however, I'm not exactly sure where it is or if it still exists. But I'd be really leary about living in one be it on the bottom or the top. LOL! Good morning John. This is interesting and funny too. I want a tiny house myself. Where? I don't know. Tiny Houses will have their challenges in the coming years I think Sheila Anderson Being that their largely home grown and not certified nor recognized by REHI or any other govermental affiliation I think they have their work cut out for them. That stated, I have been reading and seeing snippets on Tiny Houses about designated areas that will allow the development of them and some that have already sanctioned them but I don't know where either. However, ADU's are another story altogether and are being legalized in many states and building jurisdictions Nationwide. It's only a matter of time before this goes from a cottage Industry (pun intended) to a full scale growth industry. I totally agree Belinda Spillman Tiny Houses are a sweeping trend now no doubt and will probably go with the wind at some point leaving only a few purveyors who've figured out ways to capatilize on them and make them a little more like regular travel trailers. Just my thought. And thank you Kathy Streib for the recognition and helping us spread the word about this. I'm with Kathy Streib - amazing (and scary) photo! Congratulations on your feature in Kathy's weekly list of must reads! I have heard most of the terms being used but never heard the term ADU. In regards to tiny houses, in my mind they are always mobile. I'm seeing more and more areas that have sites set up for "tiny houses", though I would still call them mobile home parks. I'm so glad that Kathy Streib featured your post in her "Ah-ha" moments for the week! Love the photo and a great explanation. The last photo blew me away! John DL Arendsen You are the go-to source for ADU information when we will encounter client inquiries in the future. Big thanks Lise Howe ! Most "TINY HOUSES" are mobile Eva B. Liland with Century 21 Doug Anderson An "ADU" can be "TINY" but it can't be "MOBILE" in Cali. They have to be installed, be they HUD MANUFACTURED HOME, MODULAR, FACTORY or SITE/STICK, on a "PERMANENT FOUNDATION", PERMITTED and INSPECTED by the local jurisdiction to be legal. Or if they were built without a permit an "AS BUILT PERMIT" may be obtained in many if not most building jurisdictions rendering theim "LEGAL NON-CONFORMING". Thanks Dorie Dillard albiet I'm proud and happy to be taken as Thomas J. Nelson, Realtor,CRS,ePro it's actually me. LOL But thanks for the comment and compliment. WOnderful post! I can see why Kathy chose to highlight it this week! This is a great article John DL Arendsen and after having you on our Podcast, I have a deeper appreciation for the need for this type of living unit(s). Well I certainly learned alot in your post. I was pretty sure I understood the differences between Tiny Houses and ADUs. Wonder if HGTV will get on the ADU bandwagon?! Kathy Streib is a very sharing soul Kristin Johnston - REALTOR® Can't thank her enough. HGTV needs to get on board on this for sure Jeff Dowler it's going from a cottage industry (pun intended) to a major growth industry almost overnight.